﻿Week 1 in the NFL was dominated by TEs, including Tyler Eifert and Travis Kelce. The Packers duo of Davante Adams and Eddie Lacy were the two most owned in DraftKings Week 1. Carson Palmer was the top QB, Carlos Hyde the best RB, Julio Jones topped all WRs, Eifert and Kelce just barley outscored Austin Seferian-Jenkins and the Panthers put up 21 points against the Jaguars. Week 2 is all about figuring out which players are for real and which players were fools gold and who can rebound from a bad game/tough matchup. The Bucs just allowed rookie Marcus Mariota, in his NFL debut, to throw for 4 touchdowns. They now face Drew Brees! Brees ($7,800) will be feasting on a weak secondary that will have trouble covering Brandin Cooks ($7,000), Brandon Coleman ($3,300) and Marques Colston ($5,400). And don't forget, Mark Ingram ($5,900) led the Saints with 9 targets, 8 receptions and 98 receiving yards. He only saw 8 rushing attempts, picking up 24 yards against the Cardinals last week. 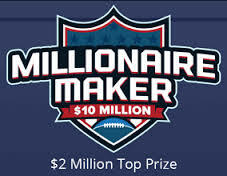 Click Here to Win $2 Mil! Lost in the Thursday Night loss to the Patriots was Ben Roethlisberger's ($7,200) stats. He threw for 351 yards, completing 24 of his 38 attempts and a garbage time TD to Antonio Brown ($8,800). Sure, the Niners just dominated the Vikings, but Minnesota looked like they were playing their first preseason game of the season. The Steelers are 6.5 point favorites at home and a Big Ben/Brown stack could prove valuable. Veteran TE Heath Miller ($3,500) matched Brown's team high 11 targets. Pittsburgh will have trouble containing Carlos Hyde ($5,100) and covering Vernon Davis ($3,000). Pitt just allowed 4 touchdowns to Patriots TEs including 3 to Rob Gronkowski. Davis led the team with 6 targets and 47 yards. The Ravens just played a real slobberknocker with the Broncos which hurt everyone's value in that game last week. The Raiders are coming off a 33-13 point loss to the Bengals. Things could open up for Joe Flacco ($6,400) and Justin Forsett ($6,200) this Sunday. Steve Smith at $6,000 could give a nice return against a young Raiders secondary. It doesn't matter if Derek Carr or Matt McGloin are under center, don't play Amari Cooper (6,400). The Ravens defense just held Peyton Manning, Demaryius Thomas and Emmanuel Sanders to 150 passing yards. 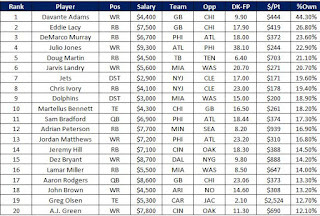 Latavious Murray ($5,800) is the 12th most expensive RB, and will struggle to rank in the top 12 come Monday night.